Directors/Producers – Don Bluth & Gary Goldman, Screenplay – Susan Gauthier, Bruce Graham, Bob Tzudiker & Noni White, Animation Adaptation – Eric Tuchman, Based on the 1956 screenplay by Arthur Laurents (Adapted by Guy Bolton from the Play by Marcelle Maurette), Music – Stephen Flaherty, Songs – David Newman. Production Company – Fox Family Films. 1916, St Petersburg, Russia. 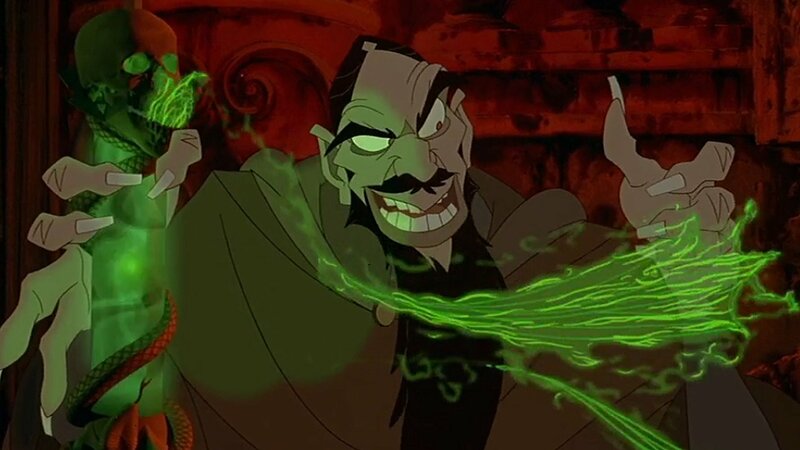 When he is banished from the Tsar’s court, the evil monk Rasputin sells his soul to enact sorcerous revenge on the royal family and then raises the masses to overthrow them. The young princess Anastasia flees to safety but grows up with no memory of her past. 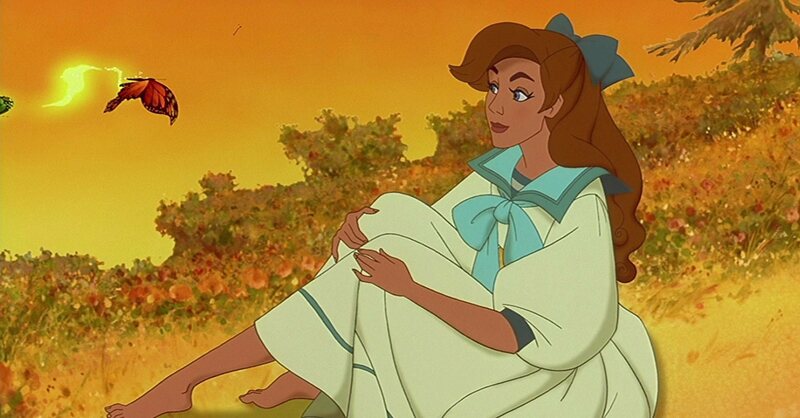 She is found by Dimitri, an ambitious former servant boy, who thinks she is a lookalike for Anastasia. He presses her to pose as Anastasia in order to obtain the exiled dowager empress’s fortunes. Gradually, Dimitri comes to fall in love with her only to discover that she is the real Anastasia. Meanwhile, the evil Rasputin, banished to limbo, plots to kill Anastasia. The career of animator Don Bluth is one that has been punctuated by a series of ironic reversals. Bluth and several associates left Disney Studios in 1975, unhappy at the studio’s betrayal of their great animated tradition. [The period for Disney that had peaked between 1937 and 1945 with the likes of Snow White and the Seven Dwarfs (1937), Bambi (1942), Pinocchio (1940), Dumbo (1940), Fantasia (1940) et al, and which had fallen into decline in the 1960s and 1970s with the banal likes of The Sword and the Stone (1963), The Jungle Book (1967), Robin Hood (1973) and The Rescuers (1977)]. Vowing to make their own return to the Disney tradition, Bluth made The Secret of N.I.M.H. (1982), a beautifully constructed homage to the classic Disney films that can easily stand up alongside some of the studio’s best. Unfortunately, The Secret of N.I.M.H. was not a box-office success and Don Bluth was reduced to making far less ambitious, although generally passably enjoyable middle-of-the-road animated fare like An American Tail (1986), The Land Before Time (1988) and All Dogs Go to Heaven (1989). Sadly however, Bluth’s work in the 1990s – Rock-a-Doodle (1991), Thumbelina (1994), A Troll in Central Park (1994), The Pebble and the Penguin (1995) – sank to an insipid banality far below what Disney as putting out at their worst. The great irony then was that Disney from about 1991 onwards started to recapture their own classic tradition with a series of epic animated features – the likes of Beauty and the Beast (1991), Aladdin (1992), The Lion King (1994), Pocahontas (1995), The Hunchback of Notre Dame (1996) and Hercules (1997). The triple irony for Bluth is that Disney were so successful at returning to what they do best that he then found himself re-employed by a rival studio – 20th Century Fox – wanting to market their own brand of high-quality artistic animated features in the same Disney tradition. The good news is that Anastasia is easily the best film Don Bluth has made since The Secret of N.I.M.H.. He has been granted the budget to make a film that uses a large-screen artistic canvas. Anastasia also emerges as a much less pretentious and better animated film than the last few Disney films – Pocahontas, Hunchback and Hercules – have been. It gets the balance just right – some marvellously exciting action sequences aboard a runaway train; a light but not excessive line-up of songs; just a touch of romance; a likeable supporting cast of small cuddly talking animals – and winds everything into an enjoyably well-rounded story. Perhaps in the end sight, Anastasia falls short of standing up there among the great animated Disney classics like Snow White, Bambi or Fantasia, but is one that can ably hold its own at least among the second rung of Disney films such as Cinderella (1950), One Hundred and One Dalmatians (1961) or The Aristo Cats (1970). My only quibble with Anastasia might be its dubious historical authenticity. As the unearthing of the Romanov family’s remains at Ekaterinberg in 1991 and DNA testing conclusively proved (except to all bar the Russian Orthodox Church), Anastasia did not manage to escape the same fate as the rest of the Romanovs – of being assassinated by the Bolsheviks in 1917. This leaves Anastasia in the embarrassing position of basing itself on a proven fraudulent story (that of Anna Anderson and several other impostors who claimed to be Anastasia following the Russian Revolution). The unearthing of the Romanov remains was well publicised and the film could hardly not have known about this when it went into production. Even more amusing is the story’s managing to sweep aside almost all details of the Russian Revolution. Seemingly as though Hollywood is still haunted by the spirit of the McCarthy blacklisting of Communists, not a single mention will you find anywhere of Lenin and the Bolsheviks who were the crucial instruments of the Russian Revolution and the overthrow of the Romanov dynasty. The film rather amazingly comes out to state that the entire Revolution was not a people’s uprising against a cruel and incompetent aristocracy but was instead all down to the blackhearted Rasputin selling his soul in revenge for being banned from the Tsar’s court. (The Communist Revolution all down to Satanism – one wonders if they might not be able to make a case for an ultra-right fundamentalist subtext somewhere there!). Don Bluth later made a video-released sequel Bartok the Magnificent (1999), which spun off the character of the titular talking bat voiced by Hank Azaria, who is now made into the hero rather than being Rasputin’s sidekick.